Lighting A Revolution: Ink Blotter 147 "Suppose you had a loadstone...."
Blotter number 147; image number: LAR_B147. "Suppose you had a loadstone which would draw people away from your competitors' stores into yours. That would be fine, wouldn't it?" "That is just what an Electric Sign does for you. It reaches out as far as it can be seen and persistently yet patiently and politely presents your invitation to the public." "Store architecture is surprisingly similar nowadays and unless your place of business has some characteristic individuality to distinguish it, it will often be overlooked. An electric sign will give you the right kind of individuality and stamp it indelibly on the minds of the buying public 18 hours out of every 24." "The high efficiency of Edison Mazda sign lamps has reduced the cost of operating an electric sign to such a point that you should know at once how little it will really cost you to add an electric sign to your selling force." "Telephone us today and our Electrical Advertising Specialist will arrange to call on you." "39th St. Theater sign, 2-sides, 240-5 watt lamps. The cost of operating this sign at the average rate for current is 12¢ per hour." This is an instance of advertising aimed at business, rather than residential, lighting customers. Note the heavy use of text with only one small, bland image. The impression given is that a business customer would more likely respond to rational arguments and not emotional impulses. In this instance we witness the need to actively sell electric signage, devices taken for granted today. 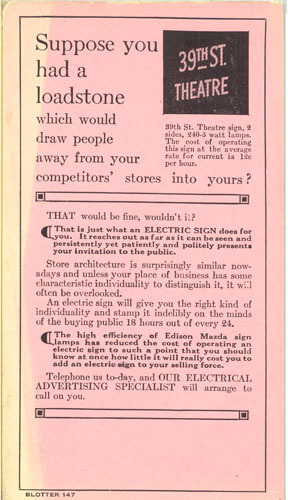 Electric signs were a significant investment and business-people needed to be convinced that they worked. The cost of operating the sign is given for comparison with other advertising costs, and so anyone interested could estimate a budget. Note also the comment about influencing "the minds of the buying public 18 hours out of every 24." Few businesses in this era planned on operating their signs 24 hours a day. "Sign lamps" refers to a type of incandescent lamp made especially for use in electric signs. Neon signs were developed in the 1910s and provided strong competition to incandescent signs. The discolored strip along the blotter's left side appears on the actual blotter and may be fading due to light, or water damage.